The opulent city of Dubai may be magical in the daytime but, when the sun sets, that’s when the skyline really comes to life. Known for its impressive shopping malls and world-famous water parks, there is still plenty to see and do in Dubai after dark. With this in mind, let’s take a look at the ultimate ways to explore Dubai by night. 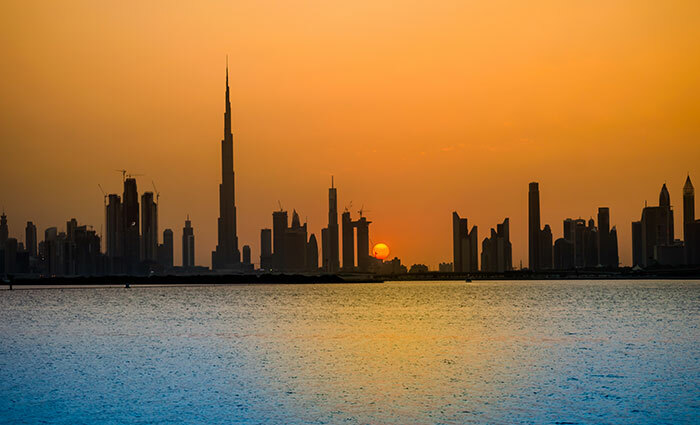 With 360-degree views of the Dubai skyline, there is no better place to watch the sun go down. This nightlife hotspot has an electric vibe with luxe sofas that provide the perfect place to sip a cocktail and enjoy some nibbles, all the while listening to music provided by local and international DJs. The Burj Al Arab hotel and its colour-changing design provides the perfect backdrop to your evening. With so much to see and do after dark in Dubai, putting together the ultimate nighttime itinerary is quite the challenge. With this in mind, the world’s largest fountain display should be high up on your list, and where better to take in this majestic display than from one of the overlooking restaurants? Souk Al Bahar is where you will find some of the most spectacular views of the fountains by night. The elaborate shows take place every 30 minutes, 6-11pm. 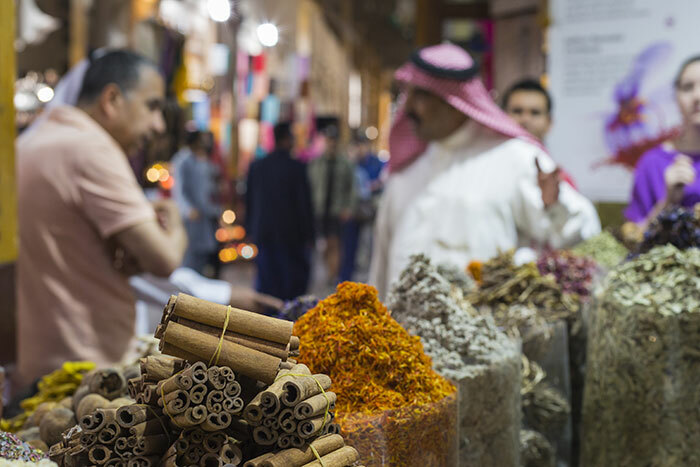 An obvious choice for anyone visiting Dubai at night, the souks are brimming with delicious local delicacies, traditional fragrances and aromatic spices, decadent jewellery and fashion. These impressive markets have a bustling atmosphere that is full of energy after dark. Based in downtown Dubai, Souk Madinat Jumeirah is a hub for food, shopping and nightlife. The interior is modern and glitzy and contrasts sharply with the building’s exterior, which is modelled on an ancient Arab citadel. From night cruises to golf, not to mention the opportunity to sleep under the stars, there is no shortage of exciting evening activities to take part in. Even dune bashing and camel riding can be done once the sun sets. How about a romantic dinner for two in the desert? Or camping under the stars? For a once in a lifetime experience, why not take in all of the beauty of the city from the air? Enjoy a helicopter tour and see the city lights in all their glory. Dubai is a hub for exquisite restaurants, bars and nightclubs so why not head to one of the city’s VIP hotspots? Among the best places to spend a night is WHITE Dubai, one of the most glamorous rooftop nightclubs that offers unrivalled views of the city’s iconic skyline. For a nightlife experience that is as opulent as it is exclusive, Armani/Prive is nestled within the coveted Armani Hotel in the Burj Khalifa, the world’s tallest building. It’s where Dubai’s elite go to party. If your dream night in Dubai is dinner and drinks, head for Billionaire Mansion – a swanky five-star venue that is truly a superb place to soak up after dark. For epic DJ sets and a glamourous ambience, look no further than Cavalli Club. Dubai has so much to offer and the fun doesn’t end at sunset. Use this handy guide to put together the ultimate after dark itinerary. Check out our range of Dubai holidays to find your perfect itinerary. Alternatively, build a custom trip with a little help from one of our Travel Experts – book an appointment to meet them today.